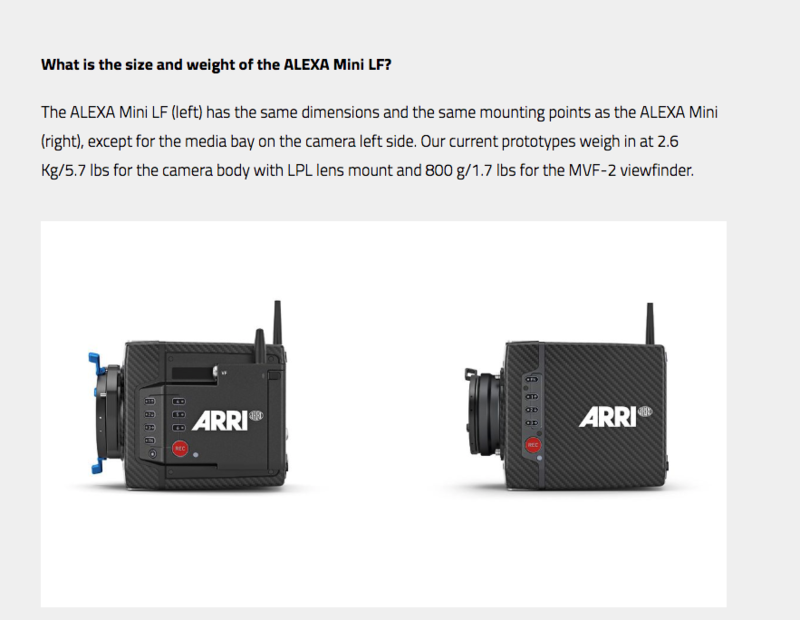 Arri released news of the new large-format Alexa Mini they call the Alex Mini LF. 4.5K version of the ALEXA sensor, which is twice the size and offers twice the resolution of ALEXA cameras in 35 format. Shipping said to start mid-2019, no price set as of yet. As of now, it will only record to the Codex Compact Drive 1TB at a cost of $2,217.82. 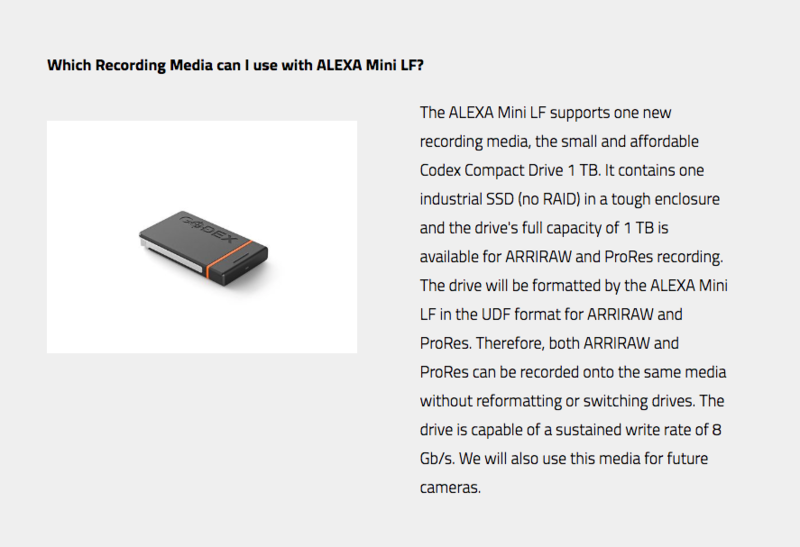 The Drive will be formatted by the ALEXA Mini LF in the UDF format for the ARRIRAW and ProRes can be recorded onto the same media without reformatting or switching drives. The drive is capable of a sustained write rate of 9 GB/s. Arri says they will also use this media for future cameras as well. 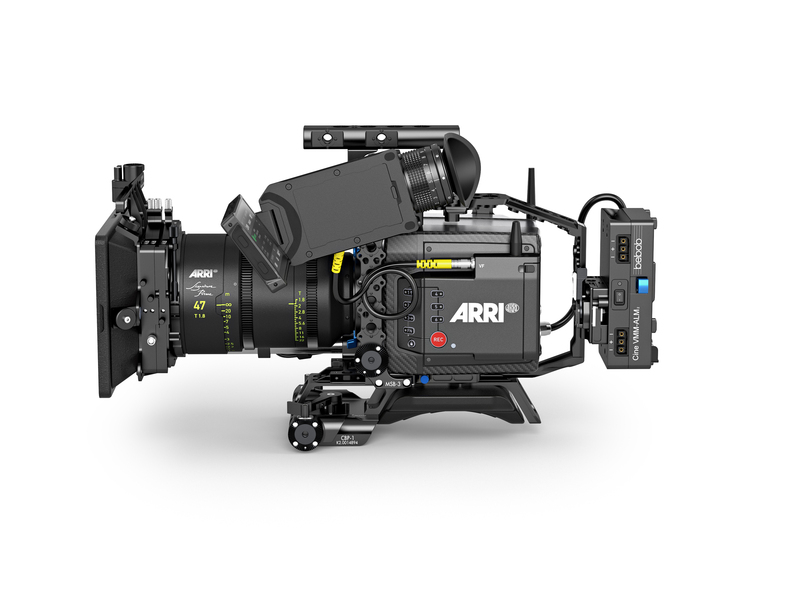 March 28, 2019, Munich – ARRI today unveils its new ALEXA Mini LF camera. Combining the compact size and low weight of the popular ALEXA Mini with the large-format ALEXA LF sensor, ALEXA Mini LF brings exciting new creative possibilities to ARRI’s large-format camera system. Robust and reliable, it provides the best overall image quality for large-format shooting, and features three internal motorized FSND filters, 12 V power input, extra power outputs, a new Codex Compact Drive, and a new MVF-2 high-contrast HD viewfinder. ARRI’s large-format camera system launched in 2018 and is based around a 4.5K version of the ALEXA sensor, which is twice the size and offers twice the resolution of ALEXA cameras in the 35 format. This allows filmmakers to explore their own take on the large-format look, with improvements on the ALEXA sensor’s famously natural colorimetry, pleasing skin tones, low noise, and suitability for High Dynamic Range (HDR) and Wide Color Gamut (WCG) workflows. LPL adapter, and Lens Data System LDS-2. 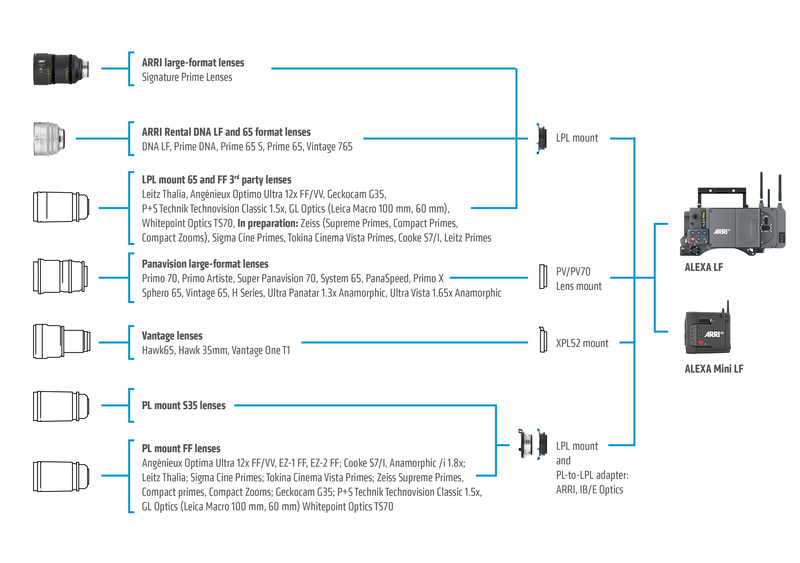 The combined feature sets and form factors of ARRI’s two large-format cameras encompass all on-set requirements. 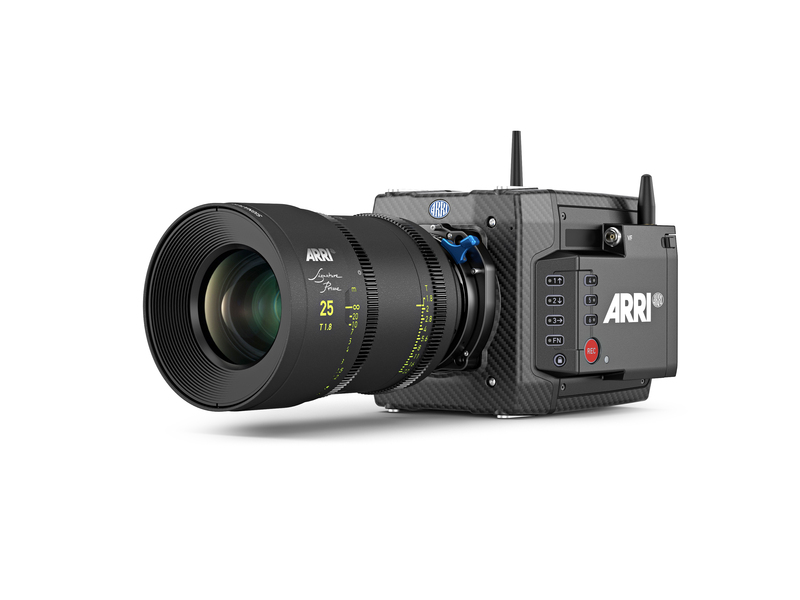 Following in ARRI’s long tradition of manufacturing rugged, reliable cameras, ALEXA Mini LF is built for prolonged life of tough usage in challenging professional conditions. 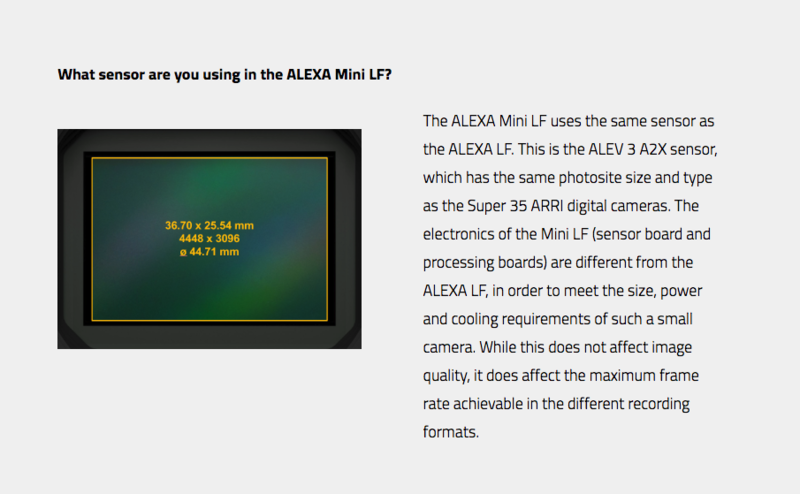 With a hard-wearing carbon body and a uniquely wide temperature range of -20° C to +45° C (-4° F to +113° F), each ALEXA Mini LF is put through a rigorous stress test before leaving the ARRI factory and is then supported by ARRI’s global service centers. While ALEXA Mini LF is compatible with almost all ALEXA Mini accessories, it brings significant enhancements to the Mini camera design. Among them are extra connectors, including regulated 12 V and 24 V accessory power; a new 6-pin audio connector; built-in microphones; and improved WiFi. 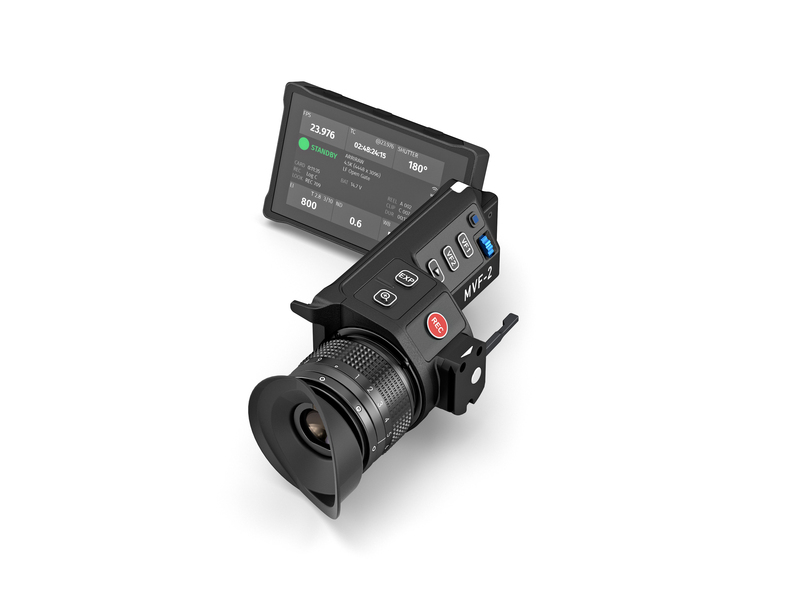 Six user buttons now adorn the camera’s left side, and the camera and viewfinder each have their own lock button, while user access to the recording media, and VF and TC connectors, has been made easier. ALEXA Mini LF allows internal recording of MXF/ARRIRAW or MXF/Apple ProRes in a variety of formats and aspect ratios and is the first camera to feature the new Compact Drive recording media from Codex, an ARRI technology partner. Small and lightweight, but solidly built, the 1 TB drive offers a reliable, affordable recording solution. With it comes a USB-C Compact Drive Reader that can be used without any extra software or licenses on Mac or Windows computers. In addition, a Compact Drive Adapter can be used in any dock that accepts SXR Capture Drives, potentially more than doubling download speeds. Another development from Codex now makes large-format shooting a more practical and budget-friendly option: Codex High-Density Encoding (HDE) uses sophisticated, loss-less encoding to reduce ARRIRAW file sizes by around 40% during downloading or later in the workflow. This lowers storage costs, shortens transfer times, and speeds up workflows, which translates to a direct 40% saving in time and money. HDE is free-of-charge for use with Codex Capture or Compact Drives, openly shared, and fast: ARRIRAW Open Gate 4.5K can be encoded at 24 fps on a modern MacBook Pro. de-fogging, and a built-in headphones connector. Stephan Schenk, Managing Director of ARRI Cine Technik and responsible for ARRI’s Business Unit Camera Systems, says: “The ALEXA Mini LF is a fantastic addition to our large-format system and will complement the ALEXA LF, rather than replace it. The ALEXA LF is a great high-speed camera, which is especially important for commercials, where 150 fps in 4.5K resolution and full image quality is important. It is, in fact, how an ARRIFLEX 435 still complements an ARRICAM on set. With the addition of the Mini LF we now have an answer for all shooting requirements. ALEXA Mini LF cameras are scheduled to start shipping from mid-2019. Thinking of Attending Adam Epstein’s Cutting Edge Tour?